Can you believe that Valentine’s Day is only one week away? 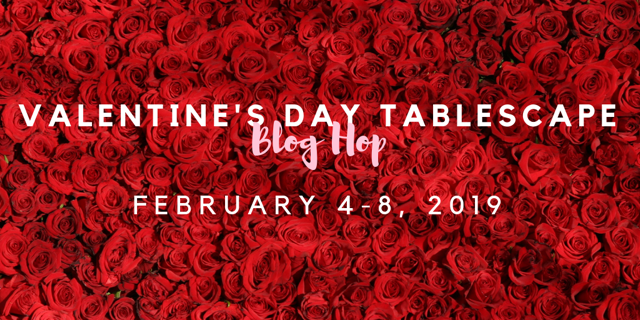 Today I am so excited to join in on the Valentine’s Day Tablescape Blog Hop, hosted by the lovely and talented Chloe, from Celebrate and Decorate. This week-long blog hop is the perfect place to visit if you’re looking for some Valentine’s Day inspiration. 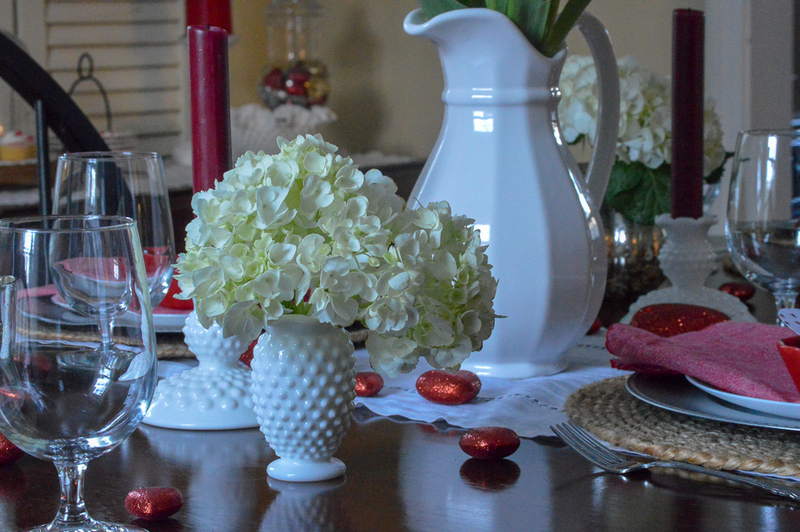 I hope you enjoy my casual red and white Valentine’s Day table and then head on over to the links at the end of this post to see all the different looks created for Valentine’s Day tables! As a wife, mom, and elementary school teacher, I love February. It is a month that is all about showing love and care to others. One way I show my family love is by creating beautiful places for us to gather and enjoy each other’s company. Adding some classic pops of bright red and white help to create this casual and family-friendly Valentine’s Day table. You don’t need to spend a lot of money to create a festive table. This table was so much fun to put together. When deciding what to use, I simply took inventory of what I had. Purchasing grocery-store flowers or scrapbook paper is a great way to add color and a personal touch without spending a great deal of money. I began with a classic white runner that I found at a flea market while visiting Martha’s Vineyard. I added vibrant red tulips in an ironstone pitcher that I had found at a tag sale. Some treasured milkglass pieces that had belonged to my grandmother bring texture and pops of white. These meaningful, vintage items bring personality to the table. My favorite white hydrangeas enhance the red and white theme. Glittery hearts from Hobby Lobby add a festive, whimsical touch. 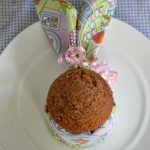 For the place settings, I created layers beginning with jute round placemats. These placemats add timeless natural texture to the table. Layered on top are silver chargers and white dinner plates, all from Dollar Tree. The dinner plates are topped with casual red napkins from Sur La Table and cute little heart-shaped baking dishes I had picked up at Michael’s a few years ago. Each place setting has a little heart that I cut out from scrapbook paper. It’s fun to leave little Valentine messages my husband and children. Of course, Valentine’s Day wouldn’t be complete without some sweet treats to share. On my side table, I created a small vignette in front of my DIY Farmhouse Shutter Wall Art. Simple cupcakes from The Fresh Market are waiting to be enjoyed! How are you planning to celebrate Valentine’s Day? I would love to hear your thoughts. Don’t forget to check out the other blogger’s tables! I know you will find some creative ideas and inspiration. Hi Lynne,you’ve set a very sweet table for the holiday. I am a vintage and antique dealer, and those old linens are one of our specialties, so that’s naturally a draw for my eye. 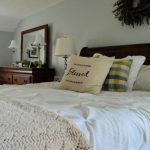 I love using the old linens, and seeing them used. Tulips are such a welcome and cheerful sight this time of year too. It’s lovely to make your acquaintance through Chloe’s hop this week. 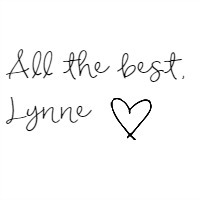 Lynne, it is so nice to meet you! I love your classic red and white tablescape with the pretty red tulips taking center stage. Your collection of treasured milk glass adds a perfect vintage element to your tabletop. Glittery hearts and hand-cut hearts make a sweet table for your family! Happy Valentine’s Day and it is a pleasure to blog hop with you this week! Very sweet table, your milk glass is lovely. Those tulips were the perfect choice for the pitcher. This is so cute. I love that you used the heart accented scrapbook paper to make your own hearts and create a message on them. Red tulips are beautiful and with the white pitcher they created the perfect touch. I like the textures you chose and of course the color red which is a favorite color for me! Lynne, I love the use of your white milk glass pitcher, candleholders and vase. It always brings to mind a relaxed feeling in the country, especially when you also used some beautiful tulips as your centerpiece. Your sun-drenched photo of your decorated buffet is very lovely too. I love the way the light streams on your wreath and cupcakes. (They look so delicious.) Your white lacy runner is so delicate and the contrast with the rattan(?) placemats is a wonderful choice. Beauty is simplicity. A breath of fresh air in the countryside at Valentine’s Day. Have an enjoyable time. As a baker, I have always just thought of using the small dishes from Michaels for baking. Silly me! Thank you for the inspiration and luckily they don’t cost a fortune. The milk glass pieces are timeless and add to the warmth of your table. Lynne, what a sweetheart of a table! And, so heartwarming with the addition of the milk glass pieces that belonged to your grandmother. I have several pieces that belonged to my husband’s grandmother tucked away. Your table has inspired me to pull them out — especially the heart-shaped lidded box. Lovely, Lynne! I pinned to my Tablescape board! Be sure to link-up at Homestyle Gathering! Wow that looks so great!!!! I’m not a huge Valentine’s Day celebrator but my Mom always did cute stuff like this when we were growing up. If I ever have kids, doubtful – haha, I would definitely do a cute table like this. I love your sweet and thoughtful Valentines Day tabkescape! I like that you incorporated the sentimental milk glass pieces into your design. Pinning! Happy Valentines Day! 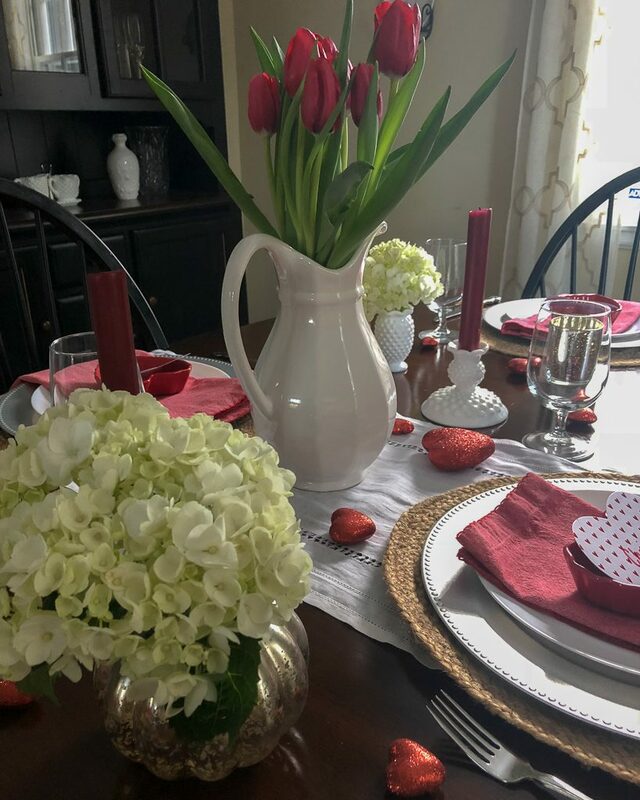 Lynne, I love your red and white tablescape and to find your white ironstone pitcher at a tag sale for your red tulips is a perfect fit. Your milk glass is a treasure from your grandmother. It is simple yet elegant. I am sure your table being family friendly has a lot to do with your talents as an elementary teacher, Some of my fondest memories are of craft time at school as my teacher taught me/us how to make holiday decor. I know that is where my desire for decorating originated. 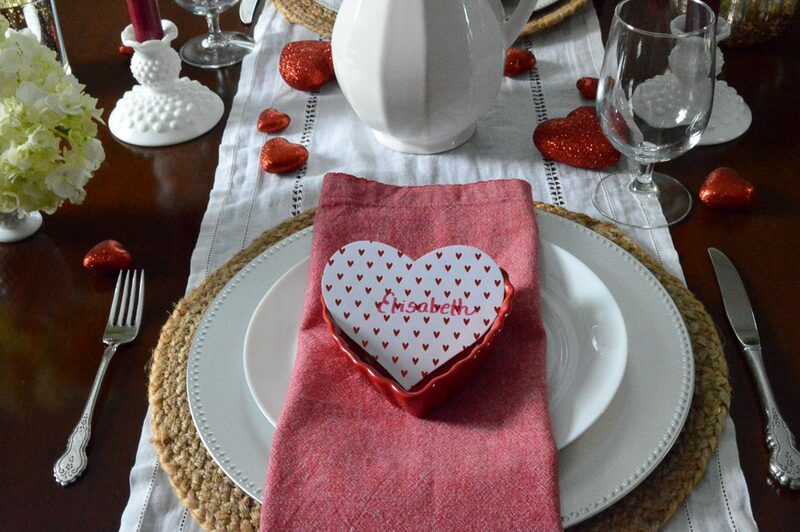 I am really digging your napkins from Sur La Tab and I adore the heart shaped dishes from Michaels. Thank you for joining us again on this blog hop…it is such fun to see the inspiration from such great bloggers. Very pretty Lynne! I love your tulips in the ironstone pitcher and the hydrangeas in milk glass! Your little buffet styling is so sweet too! I am happy to be hopping with you this week and I hope you have a Happy Valentine’s Day! Such a beautiful table setting! I’m boycotting the holiday this year due to a recent breakup, but if I were celebrating I’d love something like this! Very sweet tablescape, Lynn! I love the vintage touches, especially those belonging to your grandmother. Pinning! Love everything about this! Especially those white milk glasses – adorable and classic. I love your themed table. Vintage items and ironstone are some of my favorite things and they always add so much to a tablescape. Hi Lynn, your table is lovely. Vintage is always so timeless. Love the sprinkling of red hearts. The milk glass pitcher is a wonderful addition. Priceless memories there. Tulips are a big hit on this blog hop. The red heart dishes are so cute. A pleasure to join you on this Valentine tablescape blog hop. So elegant, Lynne! Love simple but beatiful white elements (pitcher is gorgeous!) whit the pop of red. Bravo! Thank you so much, Donna! I appreciate your kind words. The pitcher was actually a tag sale find. It’s true that one man’s trash is another’s treasure! Wishing you a very Happy Valentine’s Day! Lynn, I have that exact same white pitcher. I wish I had those cute swirly red and white plates. Cute place cards too. Thank you for your kind words, Carol! The red and white plates were a gift, but I have seen similar ones at Home Goods. Happy Valentine’s Day to you! 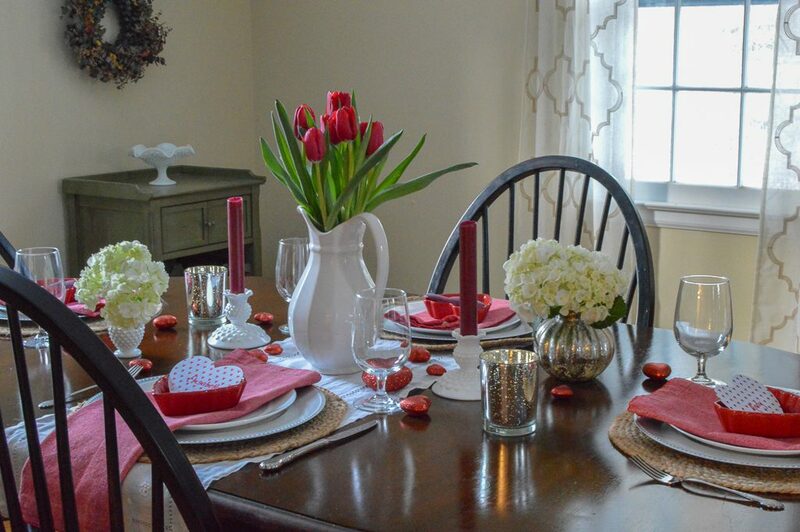 What a sweet tablescape you have styled for Valentine’s day! The red tulips in the white pitcher make the perfect centerpiece. The white hobnail pieces just seem like fun to me and coordinate with your dinner plates so well! Thank you so much for joining in our tablescape blog hop! Thank you so much for including me on this blog hop, Chloe! I am so appreciative of your kindness and generosity. Best wishes to you and your family for a Happy Valentine’s Day! Lynne, your family will LOVE all of the simple things you’ve done to make them such a sweet Valentine’s table. I especially love your personal Valentine’s to each of them. So adorable! Happy Valentine’s Day to you and your family! I am so thankful for your kind comment, Kim. Thank you! I am so happy to be joining this blog hop with you! Happy Valentine’s Day! Lynne, your tablescape is lovely! I love how you mixed the ironstone pitcher, thrifted linen runner and your grandmother’s milk glass pieces with Dollar Tree and Michaels finds. The jute chargers add nice texture to the table. It’s so nice to see fresh tulips and hydrangeas. Definitely worth the splurge! 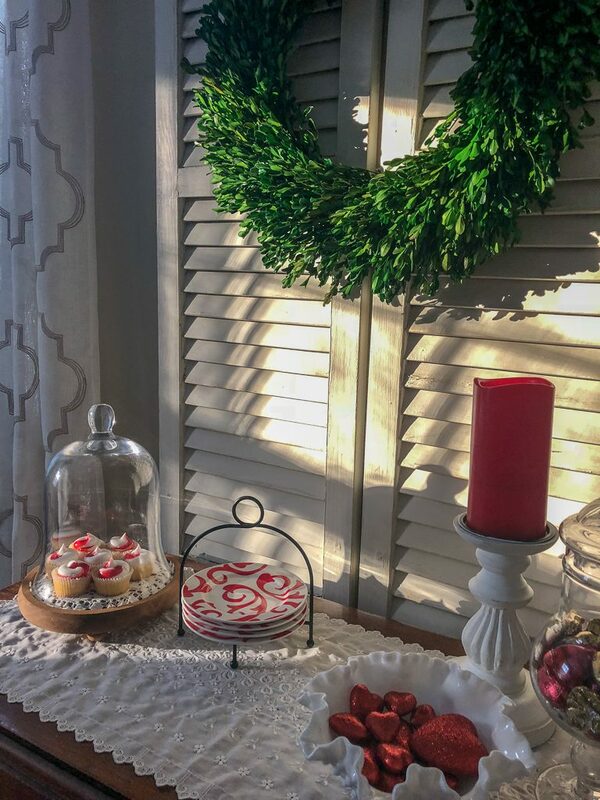 And I love the photo of your side table with the sun hitting your shutter wall art and boxwood wreath. So glad you could join this blog hop. Happy Valentines Day my friend! Thanks so much, Rebecca! I appreciate your kind words. 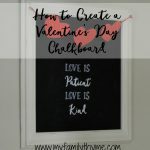 I am so glad to be part of this Valentine’s blog hop with you. Happy Valentine’s Day to you and your family!! Happy to see you at Homestyle Gathering! Hope you’ll come party with us this week, too! Thanks so much, Julie! I love your new link party!! Your lovely red and white Valentine table is classic. I love the white pitcher and of course the smaller hob nail pieces. Very pretty! Lynne, your red and white color theme is perfect for Valentine’s day! I love how those pretty red tulips just pop on your table. I also adore how you added family heirlooms to your setting. They are what make a table special. Those sweet treats look scrumptious. I would love to be a guest at this beautiful table. It has been so much fun being on this hop with you! Happy Valentine’s Day!!! Wow I just love this table setting! So pretty! 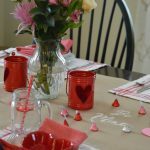 I have always loved to create a Valentines Day tablescape and a great dinner for my family. You definitely have inspired me for next year.